Quince resembles a pear in appearance and is golden when mature. However, most varieties of quince are too sour to be eaten raw. 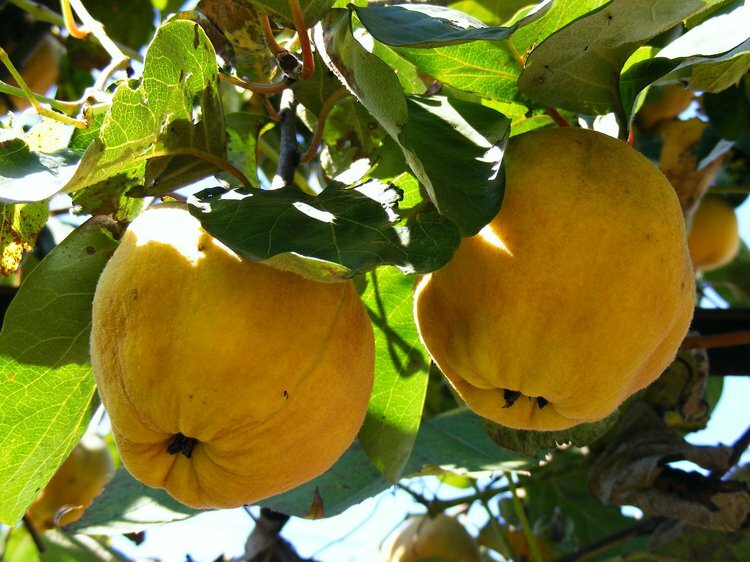 The quince (Cydonia oblonga) is the sole member of the genus Cydonia in the family Rosaceae (which also contains quinces and pears). It is native to South-west Asia, Turkey, and Iran. The fruit of the tree resembles a pear in appearance and is golden when mature. Most varieties of quince are too sour to be eaten raw; therefore, they are used to make jam, jelly, and pudding, or they may be peeled, then roasted, baked, or stewed. Here are 7 health benefits of quince. 1. Quinces are easy to digest. Quinces possess a significant amount of fiber. Fiber stimulates peristaltic motion and increased secretion of gastric juices, which eases digestion, prevents conditions like constipation, and protects the body from more serious conditions like colorectal cancer. One small quince has 4 grams of dietary fiber. 2. Quinces can help you with diabetes. 3. Quinces are lower on the glycemic index. The glycemic index ranks food and drinks based on their blood sugar increase potential. Foods high on the glycemic index like white rice and white bread will break down easily and cause blood sugar and insulin level spikes after meals, which is followed by rapidly dropping blood sugar levels. Quinces are slowly absorbed into the bloodstream, which prevents sugar crashes, sugar cravings, and mood swings. 4. Quinces may have anti-cancer properties. Quinces contain high levels of polyphenols and phytochemicals. Studies have suggested that these compounds may contribute to fighting against cardiovascular disease, asthma, and diabetes. Also, it has been suggested that regular consumption of quinces per day may reduce the risk of lung and colon cancer. 5. Quinces can help boost your heart health. Quinces decrease cholesterol levels in the body. The antioxidant activity can reduce the oxidation of fats, neutralize triglycerides, and cut fat found between blood vessels. Also, the skin of the quince contains a flavonoid called quercetin. This flavonoid can reduce inflammation in our blood vessels, which is a heart booster. 6. Quinces can help improve your eyesight. It has been suggested that quinces can treat night blindness. The flavonoid compounds and phytonutrients can reduce the free radicals that cause damage to the eye. 7. Quinces can assist in red blood cell formation. Copper and iron are essential for the new blood cell formation. Higher levels of iron in mulberries can significantly enhance the body’s production of red blood cells. A deficiency in iron can lead to anemia and fatigue. Lewandowska, U., Szewczyk, K., Owczarek, K., Hrabec, Z., Podsędek, A., Koziołkiewicz, M., & Hrabec, E. (2013). Flavanols from Japanese quince (Chaenomeles japonica) fruit inhibit human prostate and breast cancer cell line invasiveness and cause favorable changes in Bax/Bcl-2 mRNA ratio. Nutrition and cancer, 65(2), 273-285. Pacifico, S., Gallicchio, M., Fiorentino, A., Fischer, A., Meyer, U., & Stintzing, F. C. (2012). Antioxidant properties and cytotoxic effects on human cancer cell lines of aqueous fermented and lipophilic quince (Cydonia oblonga Mill.) preparations. Food and chemical toxicology, 50(11), 4130-4135. Willett, W. C., Stampfer, M. J., Colditz, G. A., Rosner, B. A., & Speizer, F. E. (1990). Relation of meat, fat, and fiber intake to the risk of colon cancer in a prospective study among women. New England journal of medicine, 323(24), 1664-1672. Giovannucci, E., Rimm, E. B., Stampfer, M. J., Colditz, G. A., Ascherio, A., & Willett, W. C. (1994). Intake of fat, meat, and fiber in relation to risk of colon cancer in men. Cancer research, 54(9), 2390-2397.